Designed to unify fax and email communications in a single user interface, the NET SatisFAXtion Email Gateway is an add-on module that allows users to send and receive faxes from virtually any email application. Inbound faxes are received at the NET SatisFAXtion fax server where the fax image is converted into a TIFF or PDF file (optional module) and then auto-forwarded to the Email Server and delivered to recipient's email inbox. easy integration with document archiving systems or workflow software and processes. 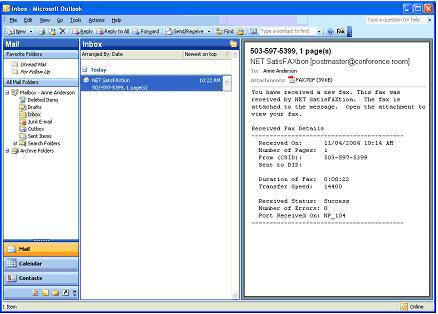 NET SatisFAXtion's tight integration with Outlook allows desktop users to email fax directly from core business applications such as Microsoft Word, Excel, PowerPoint and more, where users can send faxes with just a click of a button. Incoming faxes are routed to the user's email inbox as email messages with attachments containing the fax pages as images. Once a fax arrives in the designated inbox, users may view, store, print, reroute, fax, or forward faxed messages exactly as they would with inbound email. NET SatisFAXtion works directly with the email contact address book so that choosing a fax phone number from the email phonebook is done in the same manner as selecting an email address. NET SatisFAXtion includes a pop-up alert that is automatically displayed each time a new inbound fax is detected, notifying users instantly of any incoming fax. Included with the SMTP Email Gateway is technology that pinpoints and extracts fax addressing information from any "printed" page. Determined by either color or location, outbound emails are automatically populated with the recipients name, fax number and even subject. Fax messages, including file attachments, may be previewed before sending the message. This feature gives users confidence in sending faxes, since they can review their message and document attachments as they will appear as a fax-before clicking the Send button.